Teenage entrepreneur and business owner Chloe, from Tommi Co, started her journey to success at just 14. 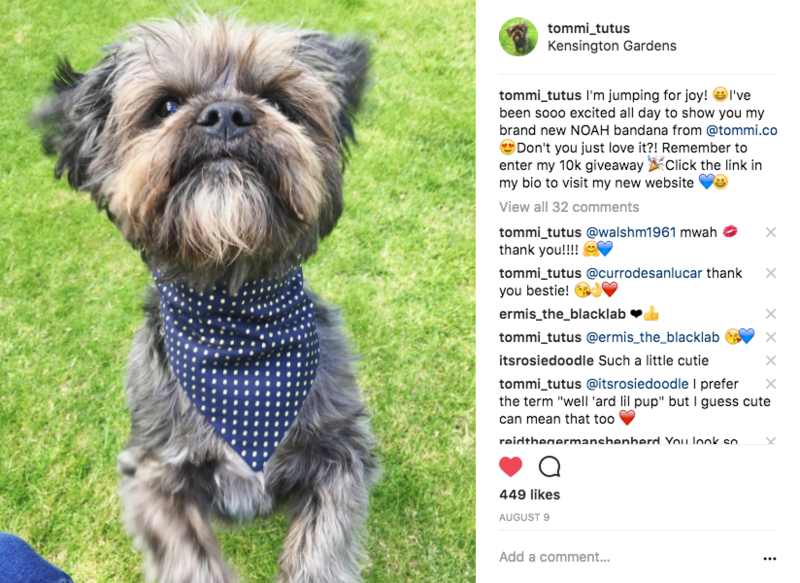 Suffering with migraines from a young age, she has spent her downtime with her dog, Tommi, and together they've created a website that generates hundreds of sales a month. 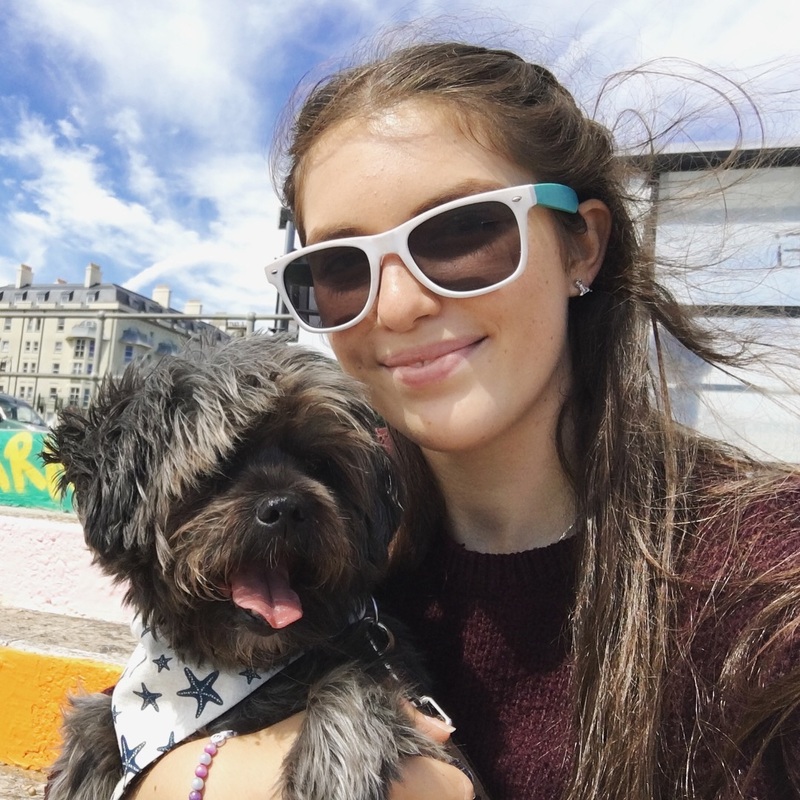 We invited Chloe to tell us how her business grew after she amassed a following of 10,000 on Instagram during her summer holiday - and she shares how you can do the same. Find an Instagram handle that’s short, snappy and relevant. This enables people to find you and have an idea of what your account is about before they start to follow you. My business is clothing and accessories for dogs - named after my dog, Tommi, who I pretend runs the account - and my handle used to be @tommis.pawsome.emporium which is a tongue-twister for most, so I changed it to @tommi.co to make it more significant to my main account and be one of the first to pop-up on the search bar. This shows people that Tommi the dog’s account is humourous, that he lives in the UK, and there’s a clear way for people to contact ‘him’ (me!). It also gives Tommi’s followers a quick link to his website - which I made on Create - which is really important. Also, don’t forget to choose a clear profile picture! When I first set-up Tommi’s account, I got blocked and had to start again. This was because I liked too many photos, followed too many accounts and commented the same “too cute!” on other people’s photos far too many times. Instagram has a limit of 1,000 likes a day, 200 follows, 200 unfollows, and 50 comments a day. Try not to repeat comments, or comment multiple times on one person’s post either. Don’t worry if you do get blocked as it’s normally just for a day unless Instagram suspects you are spamming and will freeze your account. Whatever you do, don’t use an app to gain followers. Use it to view your engagement, then unfollow any ‘ghosts’ but only do about 40 at a time. If you’re setting up an Instagram account for your business, make sure you do it with a business Instagram account rather than a normal one as this will give you Insights. Insights can be viewed by selecting the chart icon at the top right hand corner of your account. Insights show you a number of different things: the time of day when majority of your followers are online, where in the world your followers come from, and also things like how many website clicks you’ve had, or how many times your account has been viewed by a ‘unique’ account (one with a large following). I’m not going to lie, Instagram could take up a lot of my time if I let it - it’s really easy to keep checking what’s going on and get distracted. To help me with this, I have a routine that I try to stick to as much as possible. I know from my Insights that the best time of day to post is between 5pm and 6pm. This is because a lot of my followers are from the US, and over there everyone is just waking up to check their phone, and over here it’s that time of the day when people might be on their daily commute home, or are just at home for the evening with little to do. Everyday I try to leave my accounts alone until 5pm, then I go on Instagram and the first thing I do is post on both of my accounts. Then I alternate between @tommi_tutus and @tommi.co by: following 30 people, liking 100 pictures on the homepage, liking 100 pictures on the explore page, following 30 more people, liking 100 pictures on a relevant hashtag (for me, something like #dogmodel or #dogslife) then I unfollow 100 ‘ghosts’ using an app. Every hour after this I try to do the same until 9. This way I can ensure I wake-up to lots of likes, comments and new followers every morning which is always quite nice - engagement means more awareness of my business! If you’ve followed my advice so far you’ll now have some more followers, but keeping those followers engaged is just as important. All you have to do is make your account look as nice as it can possibly be so people want to see your posts pop-up on their feeds, and keep it that way. Try to take clear, defined pictures with good colours and high quality. I know that sounds daunting, but I’ve used my iPhone for every picture on my accounts, and one of them has over 900 likes! Another key thing to remember is to avoid direct sunlight, try to take photographs in natural light, but in a shady area if possible as it’s less harsh. You also need to create a theme and find out what your followers like. 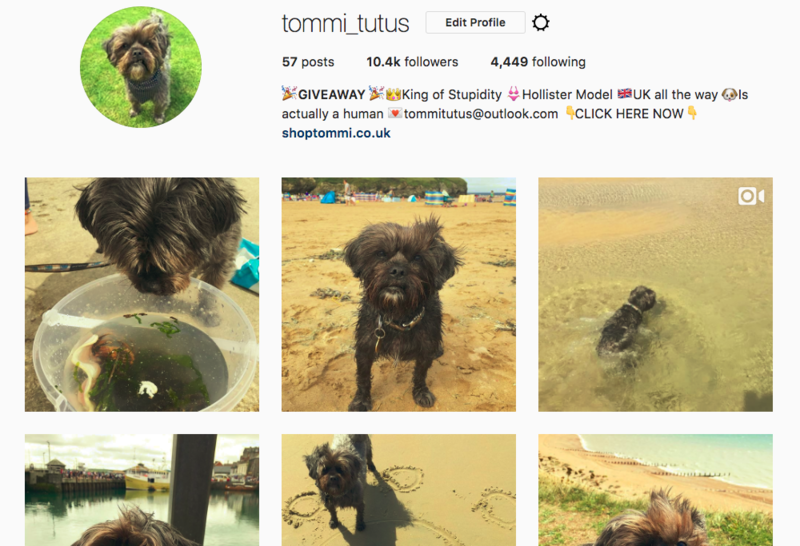 For @tommi_tutus, I know that people like close-ups of Tommi the dog smiling with a grassy background, and on @tommi.co, I repost a picture from another dog’s account (remember to ask permission before reposting) every other day. Also, try not to over-filter your images too much, as Instagram doesn’t like this. Just be natural. Try to use a single filter or maybe add some brightness, and try to keep this consistent for every post. However, always try to vary your photos as people don’t want to see the same picture on their feed everyday - videos help with this too! I can’t stress this point enough - for me, relationship building is probably one of the most important things that I can do to help my accounts grow. I find there are three different types of relationships: unwritten friends, written friends, and influencers. My unwritten friends are the people who I’ve known since I first started my accounts. These are other dog owners who have the same passion for their furry beast that I talk to through private messages. I call them my unwritten friends because every time one of us posts, it’s like there’s an unwritten rule where they like it, and it’s the same the other way around. From Instagram I’ve managed to meet some really lovely people who are all the way from Australia or Canada by popping them a quick message and a friendship blossoming from there. Written friends are usually found in a group - or in my case a pack - and have written rules that help create engagement from other Instagrammers for your account. These rules normally include having to follow everyone in the group then liking and commenting as soon as someone posts.This is then reciprocated everytime you post and helps to encourage others to like and comment on your pictures too. I would advise trying to find one of these groups, or even try and start one. Just send a private message to some similar accounts then set-up a group message once you have about 10 people interested. Finally, there’s the influencers. These are accounts that have more followers than you and have the power to make you recognised, or even get on the Explore page. Although it may seem intimidating, follow them, like and comment on a few posts, and even message them asking for some advice. I’ve done this before and not only have these accounts reciprocated the actions, but some have even suggested collaborations which is a massive opportunity because 10k may seem big, but it still has a lot of growing room! Also try to join in giveaways - even a discount code is a great prize - and don’t be afraid to ask for shoutouts. Keep learning and don't forget to have fun! Instagram has been an invaluable channel in driving sales on my website. I have Google Analytics setup on my Create Dashboard and I love learning from all the stats - Instragram is my top referring channel and accounts for over two thirds of people visitng my site. It's so good to see the social activity is turning into website sales and that the hard work is paying off! The main thing to remember about Instagram, though, is to have fun and experiment. The more that you enjoy it, the more other people will and that’s really important.